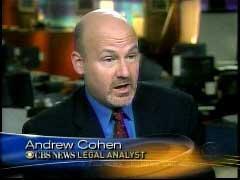 In his recent blog ("Making Headlines: The Law, Summer 2007"), CBS News legal analyst Andrew Cohen describes his midsummer night's dream of legal headlines he would "like to see, but probably won't." In the tradition of another more-famous CBS employee, Cohen lists his "top ten" legal headlines - a wish list with an obvious liberal slant. Here are some of Cohen's headlines, along with the necessary translation. The recent additions of Justices Jonathan Roberts and Samuel Alito have admittedly changed the balance of power in the Supreme Court. It was inevitable that the Court would take a conservative turn. Equally inevitable was the media's hysterical reaction. 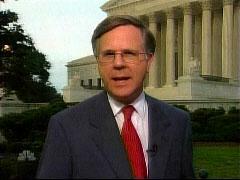 On Saturday's NBC Nightly News, correspondent Pete Williams presented a one-sided look at the Supreme Court's "shift to the right," conveying complaints by liberals over recent court rulings, but without showing any conservatives who supported some of the court's recent right-leaning decisions. The following is submitted by Jason Aslinger, a NewsBusters reader and a private practice attorney from Greenville, Ohio. Cohen pictured at right (file photo). In its rush to paint yesterday's Supreme Court ruling that struck down an issue ad ban contained in the so-called McCain-Feingold Law, the Chicago Tribune described the case as a win for President Bush and the GOP, even though the Bush administration's lawyers lost the case in question and even though the case benefits liberal activist groups as much as it does conservatives. What's more, Bush's appointees to the court actually restrained the conservative majority from taking a bigger swipe at the campaign finance law. WASHINGTON -- The Supreme Court gave President Bush and Republican leaders two important 5-4 victories Monday by clearing the way for corporate-funded broadcast ads before next year's election and by shielding the White House's "faith-based initiative" from challenge in the courts. Oh really? President Bush signed the campaign finance bill into law, it was his Federal Election Commission that pleaded and lost the case, and he's not able to run again for reelection, yet somehow he won yesterday by virtue of his Federal Election Commission losing? Years ago, my great-aunt Annie Goodman was named Mother of the Year in New Hampshire. She was the mother of 13 children, and despite the family's very limited financial resources, saw to it that 12 of them made it to college and went on to be productive members of society. That's the kind of story that, in the good old days, the CBS Evening News might have featured on Mothers Day. NewsBusters' mission is that of exposing and combating liberal media bias, and that's what I spend the great majority of my time here doing. But I hope our readers -- and my editors -- will indulge me when I offer a bit of personal analysis here. The outbreak of nastiness between the Obama and Hillary camps -- initiated by comments made by Obama supporter David Geffen and quoted by Maureen Dowd in her column today -- is stunning. For the Obama camp to come out this early -- and this hard -- against Hillary has riveted the attention of the political world. "I don’t think that another incredibly polarizing figure, no matter how smart she is and no matter how ambitious she is — and God knows, is there anybody more ambitious than Hillary Clinton? — can bring the country together." "Nightline" host Terry Moran recently blogged about the dustup over House Speaker Nancy Pelosi and her request for a larger plane to fly back to her San Francisco district. In the February 8 entry, the ABC host criticized the Bush administration for leaking the story to "The Washington Times," whom he referred to as "a kind of house organ for conservatives." "The Washington Times" certainly leans right, but has Mr. Moran ever labeled "The New York Times" a mouth piece for liberals? After the 9/11 attacks, Speaker Hastert was, for security reasons, given ‘shuttle service’ by military transport to and from his congressional district in Illinois. This year, citing the same security concerns, the Sergeant at Arms of the House of Representatives asked the Department of Defense to provide a plane that could get Speaker Pelosi to and from her district in California--which would require a bigger and costlier plane than Hastert used. What did the Bush administration do? Leak the story--to The Washington Times, a kind of house organ for conservatives in the capital. And sit back and watch the flap. Claire Shipman: "Prosecutors are trying to show that Libby lied to investigators about conversations he had with reporters regarding CIA officer Valerie Plame, the undercover agent who was outed. Libby blames a faulty memory. And in classic Washington style, Libby isn't in trouble for the original crime, outing Plame, but, rather, the, quote, ‘the cover up,’ according to the prosecutor." No government official has been charged with revealing the identity of Valerie Plame. So, how can there be an "original crime?"